Presiding Bishop Minerva Carcaño of the Phoenix Area surveys results of a May 1 vote on reconsidering retaining guaranteed appointments. The guarantee of an annual appointment for elders was eliminated by the 2012 United Methodist General Conference meeting in Tampa, Fla. A UMNS photo by Paul Jeffrey. Click on image to enlarge. View more photos. Under this new legislation, bishops and cabinets will be allowed to give elders less than full-time appointment. The legislation also would permit bishops and their cabinets, with the approval of their boards of ordained ministry and annual (regional) conference’s executive session, to put elders on unpaid transitional leave for up to 24 months. Clergy on transitional leave would be able to participate in their conference health program through their own contributions. The cabinets shall report to the executive committees of Board of Ordained Ministry the number of clergy without full-time appointments and their age, gender and ethnicity. Cabinets will also be asked to report their learnings as appointment-making is conducted in this new manner. Earlier the assembly voted down a proposal that would have allowed elders and deacons to be eligible for ordination as soon as they complete their educational requirements after serving a minimum of two years as a provisional elder or deacon. “We have a shameful history of blatant racism that led to the breakup of American Methodism into multiple denominations beginning in the late 18th century,” said the Rev. Stephen J. Sidorak Jr., staff executive of the United Methodist Commission on Christian Unity and Interreligious Concerns. It is not a new insight to discover that United Methodists don’t agree on every subject. Some delegates argued against the added sentence saying that belief and action can separate us from the love of God in Jesus. Others suggested that there is a difference between God’s love for all and human response to that love. Up to the present time, United Methodist Women has been a division of the United Methodist Board of Global Ministries. Before 1968, the organization, known as the Women’s Society of Christian Service, was also related to the Methodist Board of Missions. “This is a great result for United Methodist Women and for the church and positions us for the next 143 years of mission,” said Harriett Jane Olson, chief executive of the national United Methodist Women organization. 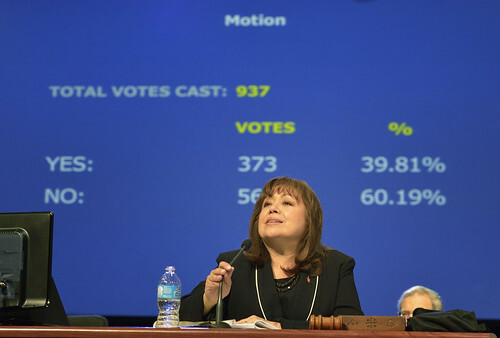 In a separate vote, oversight of the denomination’s deaconess and home missioner programs was placed with the new national United Methodist Women organization. The sixth national plan will provide resources for 80 U.S. churches, congregations and fellowships ministering to Pacific Islanders. Referred to the Board of Global Ministries a petition asking for the exploration of a ministry that could provide financial assistance to the poor by counseling, loans and gifts. The Board of Global Ministries already provides micro-loans to people in developing nations. Noted that the war in Afghanistan costs more than $100 billion per year –– money that beats plowshares into classrooms and hospitals into weapons – delegates approved a resolution calling for the “prompt and complete withdrawal of U.S./NATO forces as a necessary step toward demilitarization and reconciliation in the region.” They also called for the U.S. to shift resources from military spending and training to health and education.